Let’s build an MMDVM Hotspot! Cheaply! As you may or may not know I am a HUGE fan of the digital modes! I have never been on HF, ever! Not even once. I have also been low on income for most of the time I have been licensed so as you know HF gear is so expensive and has always been out of reach to me. I have mostly used Yaesu Fusion but using it through repeaters or more recently through my Father-in-laws gateway MB6PR located in Elswick Preston. Hotspots have been quite a recent addition to the Amateur hobby but it has grown more and more popular, starting with the likes of the DV4 Mini and now Pi-Star! I wanted a hotspot for ages as I have had the use of Waynes Tytera MD380 DMR radio and more recently the amazing Ailunce HD1! But as I do not live near a DMR repeater it was useless to be quite frank. I then finally took the plunge and bought a hotspot from DV Mega for the princely sum of £120! I had never even seen a hotspot before it arrived and was initially quite impressed by it! It featured a tiny LCD screen and an internal antenna, this didn’t perform too well to be honest and that was in part my motivation to build my very own. I then started looking more into them and thought I would give it a go myself, I mean it looks simple enough, right? Well in fact it is yes! Very simple indeed! The hotspot I built is fitted with an external antenna and a 3.2 inch Nextion screen and came in at around £65! Absolute bargain and today we are going to do it together! Don’t worry it’s not complicated, I mean if I can do it trust me you will be absolutely fine! I am by no means an expert, I just wanted to share with you how I built my own hotspot. Please research on the Pi-Star forum and Facebook group. Lets first get a list of parts that we will need to complete the project. I will use links to the items where possible. 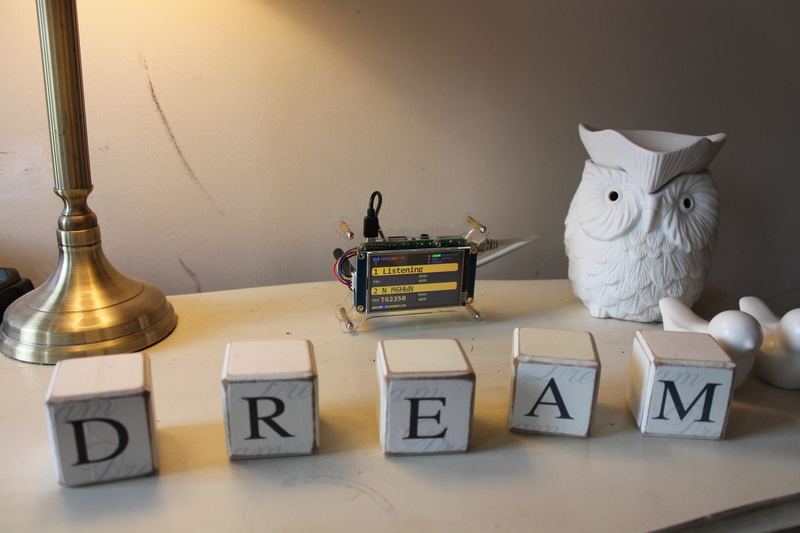 We need a Raspberry Pi 3. We will also need an MMDVM Board. I have used the Chinese version, works fine. We will need a Nextion screen, any size will do, I went with the 3.2 inch. We will need preferably a 16gb Micro USB card. If you do not have a Micro SD or SD Card slot on your PC you may need to buy a SD card reader. You can buy one from here. 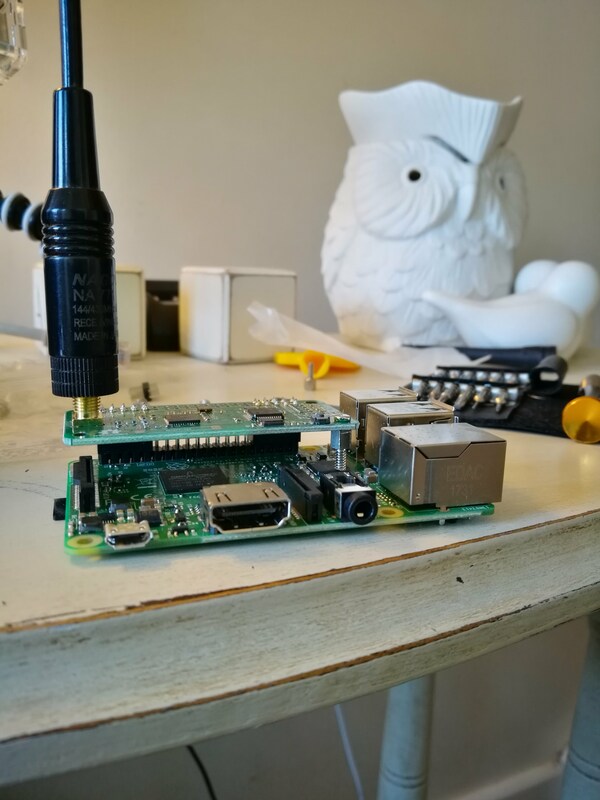 If you are wanting to have the screen connected via the USB port on the Raspberry Pi you will also need a USB to TTL Converter. I did this at first before I finally installed it in a nice clear case like it is today. Once you have got the parts we need to build the hotspot, don’t worry it’s a very easy process. Please make sure that you have discharged any static by touching something metal like your PC case for example before touching any of your nice new components. The MMDVM board just slides on the pins of the Raspberry Pi! Simple as that! There are 2 black pin connectors on the MMDVM and these just slip straight on the top of the Raspberry Pi, No soldering or anything required here. That is basically the hotspot put together! I know right! I didn’t think it was going to be that easy either really but it is, just pop the antenna on the connector now and we can move on, leave the screen for now we will cover that in a moment. Now let’s look at the software side of things, everything I will show you is totally free so you have no outlay here, good to know! Firstly we will need to Format the Micro SD card, I use a program you can download from here. 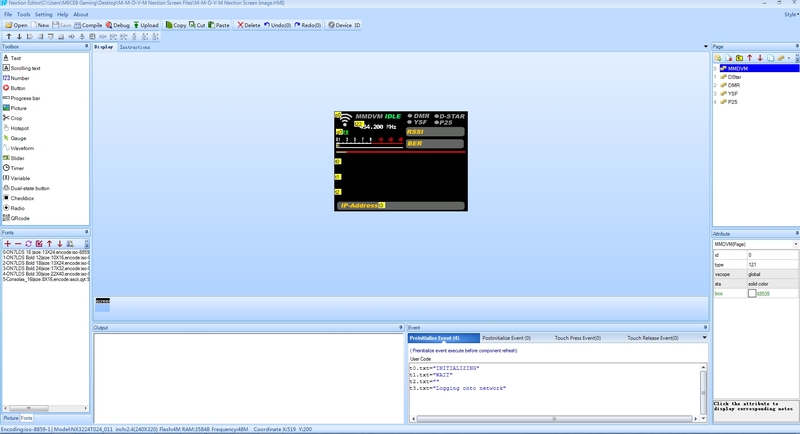 We will then need to use a program called Etcher, this can be downloaded for free here. 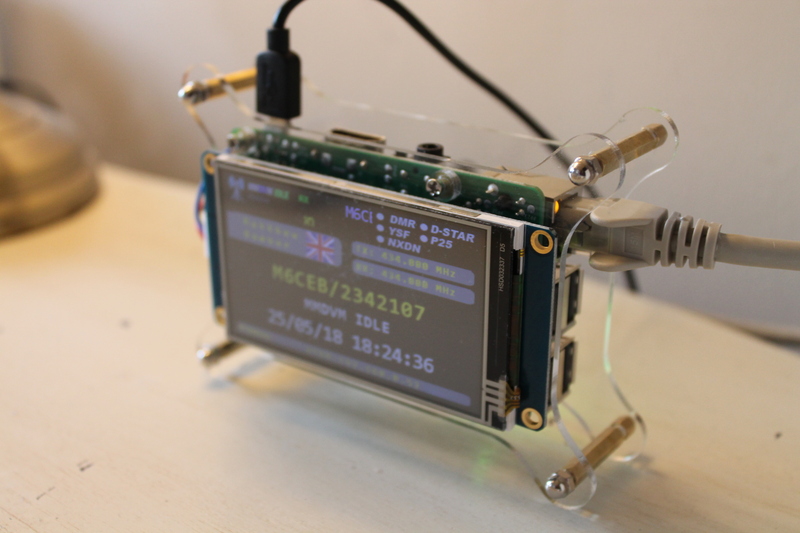 Now we need to download the Pi-Star image from this link. As of today the latest version is 18th March 2018, but you just need to make sure it’s the latest one, for now though we will download the Pi-Star_RPi_V3.4.13_23-May-2018.zip file. once you have downloaded the file, extract it and you will be left with 2 files, one of which will be an .img file, now we can begin. First thing we need to do is format your SD card. Pop your Micro SD card into your PC and open the SD card formatter and format the card. 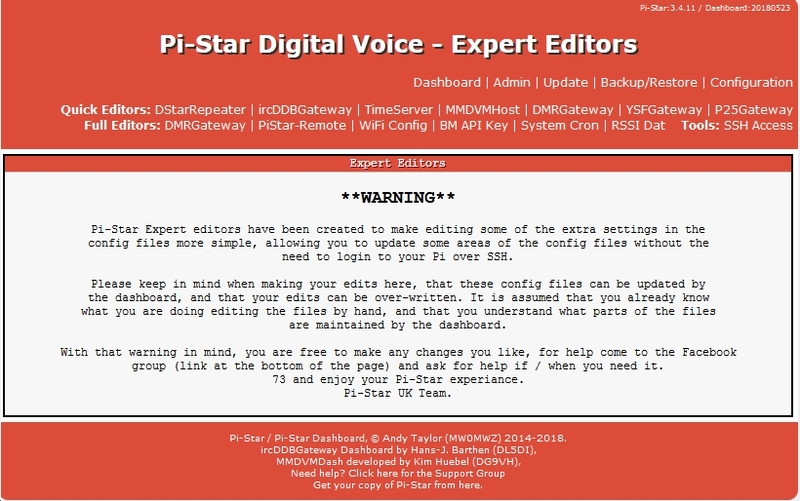 Next thing we need to do is install the Pi-Star image we downloaded earlier onto your SD card. Open Etcher and click Select Image and find the image on your computer, then click select drive and choose your SD card, now hit flash and after a couple of minutes you should have the Pi-Star image successfully flashed onto the card, you may get a couple of errors if you are using a windows machine as you are flashing a Linux based program onto the SD card so just ignore any if they pop up, you should be ok.
Now just pop the SD card into the back of your Raspberry Pi and connect your raspberry pi via an Ethernet cable directly to your router, and plug a normal Micro USB phone charger into the Micro USB power port on the RasPi. Now we just need to open a browser and type in your address bar, http://pi-star and it should give you your new Pi-Star dashboard. Now let’s set things up. Click the Configuration tab and input the username and password, this will be. Control software. We need to select MMDVM Host. Now we need to choose what modes we want to use by using the little selector on whatever mode you would like, for this example we will just look at DMR. I have the RF & Net hangtime set to 20. We can also see the Display setting here too but for now we will just leave this and come back to it a little later on. Now we will move to General Configuration. Hostname I just leave as pi-star and I recommend you guys do the same. Put you Callsign in Node Callsign. Now put in the Frequency you would like your hotspot to be on, Most MMDVM boards are UHF and one of the UK allotted frequencies for hotspots is 434.000mhz but check your band plan for your country. Enter your Latitude and Longitude. Enter your Town and grid square. In URL enter your QRZ page URL. 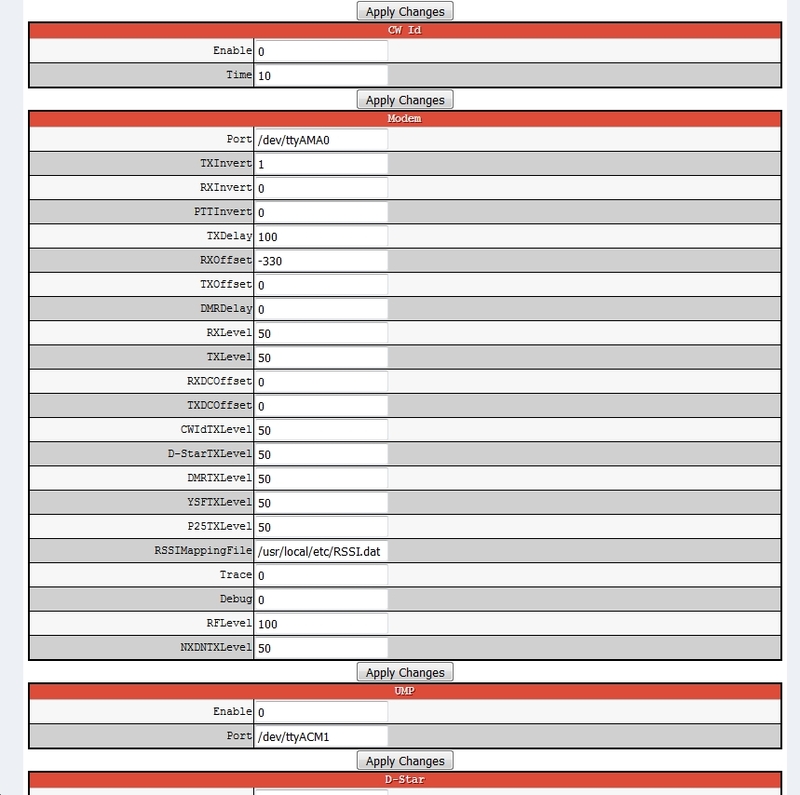 Use the drop down menu on radio/modem type and select MMDVM_HS_HAT…. Node type, I set mine on private as this is for just my use. Time zone and dashboard language. Now we go into the DMR Configuration. DMR master, use the dropdown to select the relevant one for your country. Everything on Private and Auto AP and UPNP both set to on. Now here is where you can use Wifi if you want to , but for best results I would use your Ethernet socket on the RasPi. Right! Now we should have a working hotspot, obviously you will need to make a codeplug for your radio with the talkgroups you would like to use etc and set the frequency of your new hotspot. We now need to tune it so you get the lowest BER (Bit Error Rate) rate. Really simple to do and I will explain this further now. 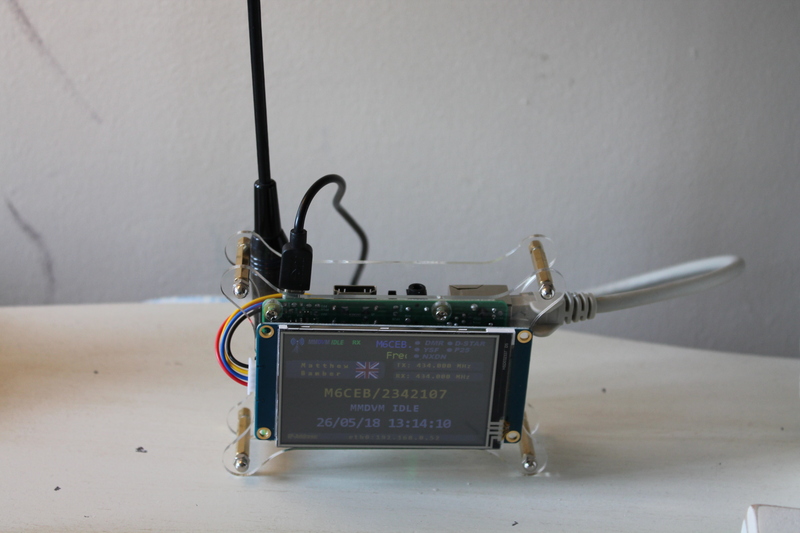 Every MMDVM board needs fine tuning so that it works perfectly with the radio you would like to use with it, on your main dashboard page you will notice at the right of the screen you should see that when people transmit (including you) it shows the duration (DUR) the Loss and BER (Bit Error Rate). ideally you want to have all green BER showing here after you finished your transmission, if not then we need to tune it. Click on your configuration page, this should show some more options at the top, one of which should be expert. Click this, then click on MMDVM Host. Now scroll down until you reach Modem. You should now see RXOffset, mine has been tuned to -330, a good way to do this is start at 100 then save the changes and return to the dashboard, transmit for a few seconds and after your transmission look at you BER rate and keep adjusting it until you get the lowest rate, for example i can operate all over my house and get a BER of 0.5% very good. Now the final step is to look at getting your screen to work. You do not need the screen, the hotspot can fully function without it if you don’t want to have one. 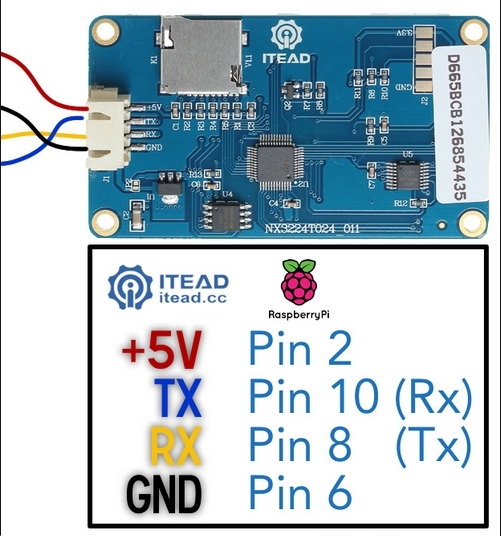 There are two ways to do this, one way is to use a TTL to USB converter and the other way is to solder the wires directly onto the MMDVM board, both work exactly the same just TTL is less permanent. On the back of your Nextion screen you should see that the wires correspond to the labels on the back, if you look closely you will see that its labelled. Now on the TTL Converter (or if you wire it directly onto the board) you need to reverse the RX and TX so the Yellow RX wire will go to the TX on the TTL or board and the Blue TX wire will go onto the RX etc.. The ground and live is kept the same. Now let’s get it to work. The way I did it was to get a spare SD card and load an image for the screen onto it and flash it to the screen using the Micro SD card slot on the back of the screen. Really simple, let’s start. First lets download the Nextion Editor for free here. Now we need to find an image, I found a really good facebook group that has some really helpful people on it, they also have loads of screens images that people have made for all different screen sizes. You can find the group here. 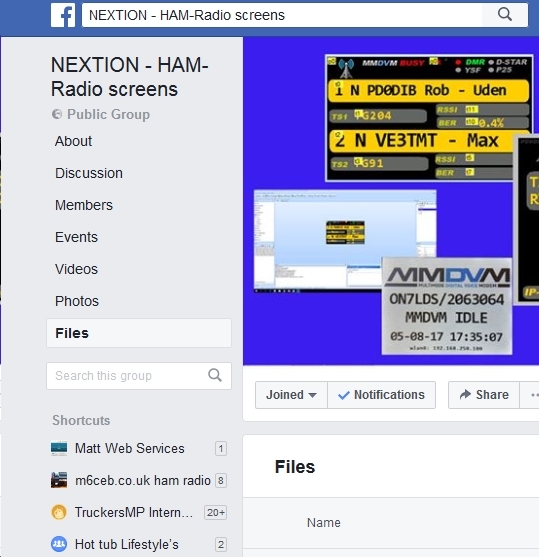 If we navigate to the files section of the group you will see loads of screens that people have made, just make sure you pick one for the right size screen you are using, this can be a bit trial and error, took me a couple of attempts to get one working but they are free so nothing lost. 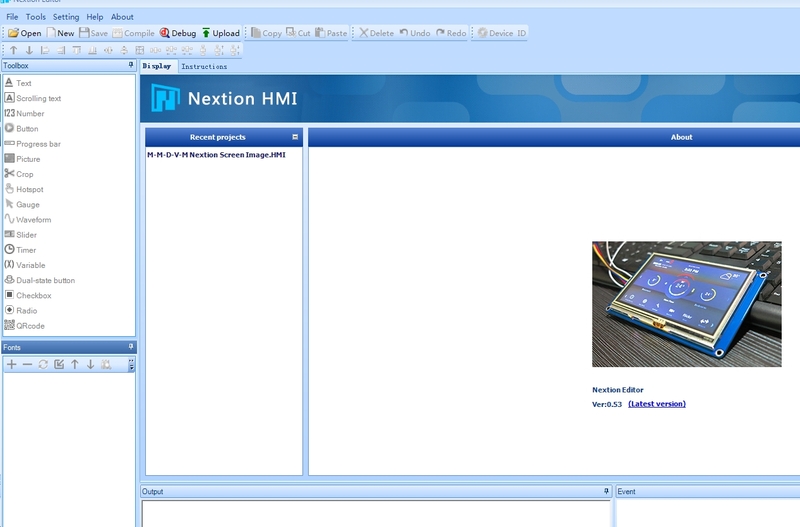 once you have downloaded a screen, open up you Nextion editor and click open and choose the file from your computer. 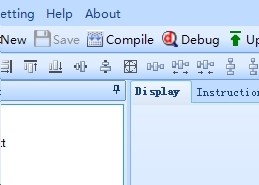 You can off course edit it as you wish but for now we just need to click Compile . you will notice it do some tests on the image shown in the box at the bottom. Now we need to open the build folder, go to file and click open build folder, you should now see your compiled image here. Right click the image and copy it to an SD card, disconnect the screen from the power source and insert the SD card in the back of the Nextion screen and give the screen power again and you should see a white screen and it will get to 100% and then say completed, again if you get any error saying wrong screen type etc.. just start over with a different screen image from the facebook group. Now disconnect the power from the screen, take out the SD card and then plug your screen back in. You should see the image now although it won’t work with your hotspot quite yet, one last step. 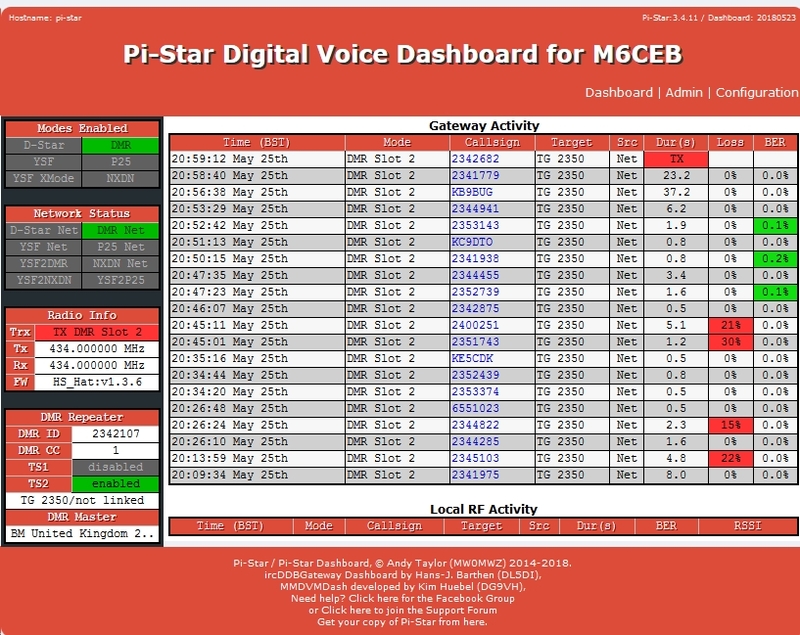 Go back into your Pi-Star configuration page and you will see the MMDVM Display Type, select Nextion from the Drop down and click the modem setting from drop down, if you have hard wired the screen to the board or DEV/TTY/USB0 if you have it connected via the TTL converter. Nextion layout is ON7DS. Phew! That’s it! All done! I really hope you found this useful and it has helped you get a hotspot built at a very low cost, I have really enjoyed building my hotspots and I am now hooked on them, would never be without one! I have also done a YouTube video showing how to build it too so please check that out, until next time thanks very much for reading and 73! Please note that this is meant to be a guide only, please do your own research to clarify 🙂 I cannot be held responsible for anything that goes wrong.